Staying off social media for a while, at least the next few days, to try and avoid some of the nastiness that is sure to be going around in regards to the presidential inauguration. I’m not going to get political here, mostly because both sides of the argument are spewing a bunch of garbage and hatred and I really can’t deal with it right now. My social anxiety has been going through the roof lately, and that is caused by social media as well, not just with dealing with people face to face. In any case, I know I had said that I would blog every day in January, and I’ve done pretty well so far – I only missed one day. I’m going to change that goal in light of all this and come back to the blog on January 30th with some new things I have planned. *whispers* I’m not currently reading anything. I know, I know, that’s weird, right? But I actually finished the book I was reading last night and I haven’t even picked out a new one, let alone started it. I used to read several books at a time, but lately it’s so much easier to read just one. My brain can only handle so much these days. Several things! Since last Wednesday’s post, I finished reading The Hobbit (review can be found here). I also read and finished The Plantation by Stella Samiotou-Fitzsimons. It was pretty good. I’m a little on the fence about continuing with the series though. Hard to explain why. The book that I just finished last night was The Miniaturist by Jessie Burton. Yes, I know that book wasn’t listed anywhere on my last WWW post. I ended up reading it because A). it had been sitting on my shelf for a while, and B). I needed it to help complete a Seasonal Reading Challenge task. Oh boy, not sure at this point, and of course, it might change by next week. I have been reading along with the reviews over at Mark Reads, going back to when he started his own website. I love his reviews and didn’t realize how many books I had missed reading with him. He’s the reason I read The Hobbit this time around. He is taking a break before continuing into The Lord of the Rings by reading Looking for Alaska by John Green, which is a book that I adore. So I might do that. I might go ahead and read the next book after The Plantation if I can track it down; it’s called The Dark Legion. I also still want to read The Handmaid’s Tale, as I said last week, so it’s pretty much a toss up. Does anyone have any suggestions? Teaser Tuesday is a weekly feature hosted by The Purple Booker. Here are the rules if you would like to play along! So this quote is from my current read. Yes, I know, it was nowhere on my WWW post last week. These things happen sometimes. I picked this one up at Barnes & Noble knowing absolutely nothing about it, but loving the cover art. I like doing that sometimes at bookstores – finding a book that just speaks to me for some reason, even if I’ve never heard of the book or the author. This one is really interesting so far and the writing is beautiful. I’ll let y’all know how it is when I finish it. Remembering the life and message of Martin Luther King, Jr. I love this particular quote. I think it bears repeating, not just with the ugliness in the world today, but always. It’s that hard. And it’s that simple. Let your geek flag fly . . .
Today has been a pretty low key day, but hey, it’s the weekend, right? I’ve spent most of my time sitting and working on another crochet project while watching Critical Role on Geek & Sundry. It’s a web based show about a group of people who play Dungeons & Dragons. What’s fun is that all of them are voice actors who has lent their voices to various animated projects and video games, so they can really be creative in making their characters sound really cool. I’ve always loved role playing games, although I haven’t had much chances to really play them. I love that they are a combination of game play and story telling which is guaranteed to be completely different every time. Plus, I really, really love collecting dice. 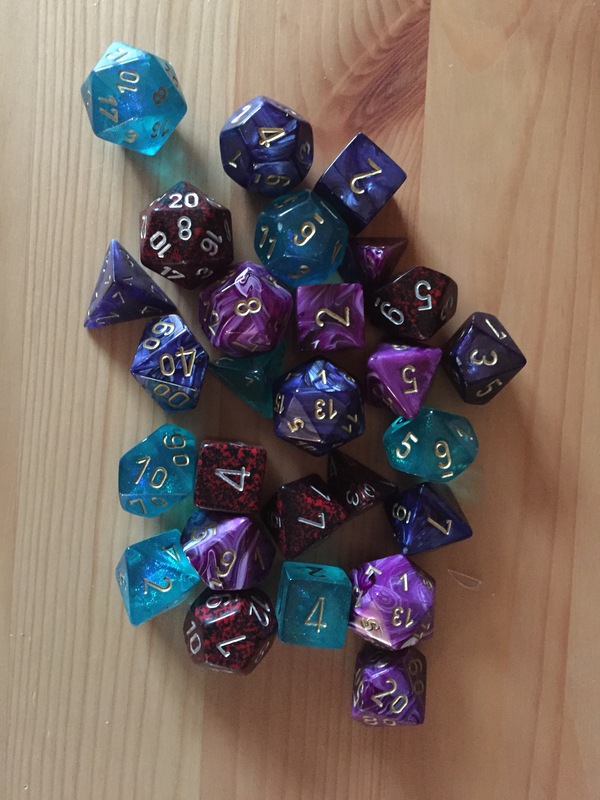 Just a few of my dice. One of these days, if time and social anxiety allows, I will find a D&D group somewhere local and join in. It would be really fun. Feeling down today, both physically and emotionally, so no formal post today. Instead, I went and did a Google image search strictly for “Inspirational Quotes.” Sometimes those are silly or cheesy, but I really liked this one. I might be on Plan M by now, but one of these plans is gonna work, right? Blurb: Bilbo Baggins was a hobbit who wanted to be left alone in quiet comfort. But the wizard Gandalf came along with a band of homeless dwarves. Soon Bilbo was drawn into their quest facing evil orcs, savage wolves, giant spiders, and worse unknown dangers. Finally, it was Bilbo – alone and unaided – who had to confront the great dragon Smaug, the terror of an entire countryside. Okay. I have to say it, and I know it is probably a very unpopular opinion. I don’t like this book. Ugh, I know I’m supposed to. I love the fantasy genre, and Papa Tolkien was the great-granddaddy of it all. But I can’t. This book annoys me to no end. Here’s another unpopular opinion – I think the movie actually did the story better justice, even with all the extra bits thrown in (hello, Legolas? and random girl elf?). It made the quest of the dwarves seem a bit more important than just, “Hey, our gold got stolen. Let’s go get it back!” It gave more of the history, which made the plight of the dwarves seem so much more real and serious. And yes, I get that this was originally supposed to be a children’s book, and most of that would be way too dense for your average child, but still. Especially knowing what lies ahead in The Lord of the Rings trilogy, this feels really silly. Slight spoiler ahead – this book is 70 years old, but still. Just in case. Another opinion that will probably be unpopular with Tolkien fans – I hate Thorin. I do. He’s terrible, especially at the end. The dragon left the Mountain, looking for the dwarves, and met its end at Lake-town. Okay. Then the people from Lake-town come up to the mountain to basically say, “Hey, we killed your dragon for you. You know have all your treasure and gold and stuff. How about you help us out since it wrecked our town? Especially since some of that treasure is stuff that the dragon stole from us too.” What does Thorin do? Pitches a hissy fit and threatens to go to war with them! Really, Thorin! Really! He’s supposed to be the leader of the dwarves, becoming King under the Mountain, and he acts like this? I was glad he died in the battle. Gandalf was a bit irritating too. He starts off with them, and then once the trip is fully underway, he takes off. Then appears at the end to basically do nothing. He’s pretty useless as a wizard in this book, although he does redeem himself in LotR. So I guess he’s forgiven. But yeah, I tried. I really did! I feel like a bad fantasy fan, but what can I say. GoodReads rating: 3 stars, but only out of obligation.